In case you don’t frequent these ends too often (and if not, you makin’ me cry), I launched my YouTube channel around two months ago. I considered making videos for over a year but sharing that side of myself seemed far more daunting than hiding behind a keyboard when blogging. With a fair few videos under my belt and more filmed and in the pipeline, I thought I would put together a very basic beginner’s guide to making videos. I am, of course, no expert and my content is far from perfect but there are a few things I’ve learnt along the way which could be useful to you! This was a big deal for me before I launched my blog because I wanted my photos to be crisp and the best quality possible. I also wanted a camera that could film high quality video so opted for the blogger’s favourite, the Canon 600D. Although everyone told me it was a huge risk, I bought this from eBay for a fraction of the retail price and I have no regrets at all – it was in perfect condition and came in the box. Do your research when buying secondhand, there are some real bargains to be had! It has a flip out screen so is perfect for filming as you can see if you’re in shot and in focus – I would hate to film blind! When choosing your camera, think about what you will really use it for. Kit with all sorts of fancy functions tend to be more expensive and it’s unlikely you’ll use all its features. I’ve used Canon cameras a lot in the past and have little criticism of them. I find Nikon’s a little slower and more fiddly, and of course you can always start off with the trusty iPhone given its great video quality. If you’ve never been filmed before, try using your phone first to see how comfortable you feel before investing in some pricey kit. I did test shoots of myself talking through my CV just to see how I reacted to the camera – talking to a camera in an empty room is strange! This is the bane of every blogger/YouTuber’s life, especially come winter (anyone else struggling already?!) 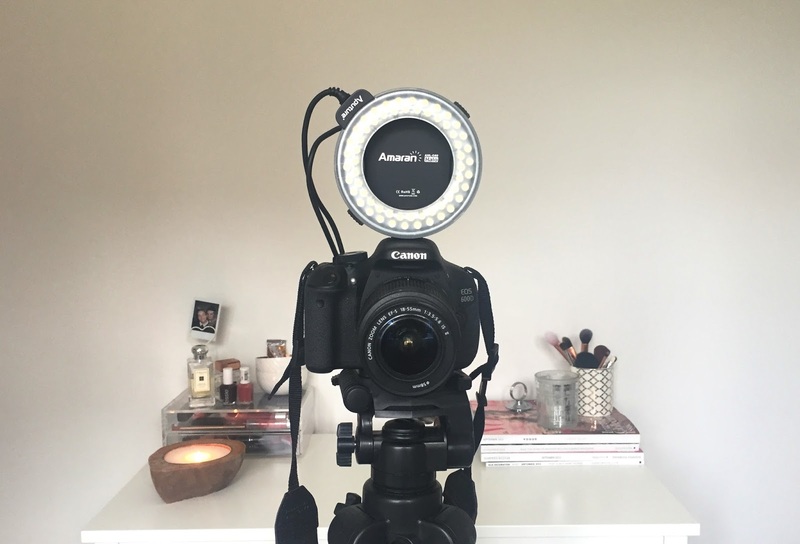 Ring and box lights are far beyond my budget so I use the Amaran Halo Light – it slots on top of my Canon and you can control the light strength, as well as having half of a ring of light if preferred. This has been a huge help for me and at £30 is the perfect tool when you’re starting out. When I’m filming, I tend to use it mounted on my camera, put my lamp on to the side out of shot and light a candle to inject as much light as possible. I also have a huge window behind my camera as natural light comes across best on camera. There really isn’t any need for a fancy tripod but make sure it is substantial enough to support your camera – SLRs tend to be weighty so a cheap, flimsy thing make not be the safest for your kit. I use the Velbon DF-61 Tripod and it’s great. Another thing to note – check the height measurements when buying online. I managed to buy one that was just 50cm when fully opened that wasn’t too useful as I’m not an ant photographer. I also have a Canon RC-06 Remote Control that I could live without – it means you can control the focussing and shooting from your seat, huzzah! There is a misconception that you need to splash out on fancy software to create good videos, but I don’t think that’s true at all. The content itself is what will make you successful and a decent edit just helps you along the way. I have a Macbook Pro and use iMovie to edit my content as it’s free and does the job. The more you use it the more you’ll learn new little tweaks to make your videos more visually appealing. I can’t imagine investing a few hundred pounds in some software while I’m producing videos for fun – it’s just not necessary! This is very much to personal taste and dependent of what you’re reflecting in your content. My videos to date have been beauty and lifestyle based and I enjoy a clean background – my first few were me perched on the edge of a bed and I tried my best to make a nice, tidy background with soft furnishings like bed throws. I’ve now invested in a stool (yes, really!) so I can sit in front of my chest of drawers and personalise the background a little – I like it to reflect my personality and real life so I use candles, magazines and my lip product-filled Muji drawers to add a personal touch. This can take an absolute decade. When visiting my mum in Devon, it took over 400 minutes to upload a video!! If you’re blessed with a quick internet connection it should take around 30 minutes to an hour to upload and process. Make sure you take a still for your customised thumbnail too – the ones they pick for you are often as you are mid-talk or you look half asleep! Fill the description box with your social media and relevant blog links, as well as any other information linked to what you discussed in the video to give your audience a really well-rounded video experience! So there we have it! An absolute BEAST of a post but hopefully of use to some of you! Let me know if you make videos and leave your links below so I can subscribe and please subscribe to my channel for new videos every Sunday! Previous Post What’s The Deal With Eye Gel Pads? packers and movers chennai Companies list for safe and secure packers and movers in Chennai for Household, office, car, bike shifting. Get Free Quote … packers and movers Indore With an upper hand in the packing and moving services, our wing at Indore has been ably delivering satisfying results to not only the people of the city and/or Madhya Pradesh but across India. packers and movers Lucknow Packers & Movers Lucknow are one of the renowned names in offering safe moving services to our esteemed clients. Moreover, our services have an excellent repute in the market as the most comprehensive and cost-effective shifting solutions.